Two small (average size: 24 mm) Forktail species (Ischnura sp.) commonly occur in many regions of Arizona: theCitrine and the Mexican Forktails. Both species frequently occur at the same time and location. Mature males of the two species are easily differentiated based on color (see pictures), but separating female can be more difficult. 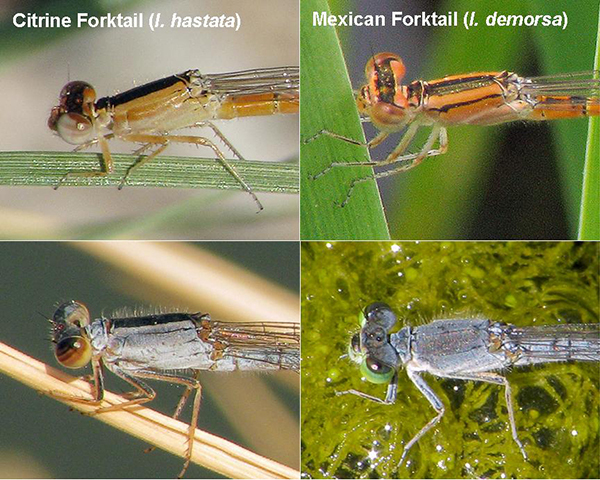 Female Citrine Forktails come in one form (heteromorph) whereas female Mexican Forktails come in an andromorph (male-like) form and a heteromorph (female-like) form. The color in females of both species changes greatly during maturation (see pictures). The challenge consists in separating age-matched Citrine and heteromorph Mexican Forktails. Mexican Forktail: humeral stripe (but can be very thin). Mexican Forktail: thorax mostly dark grey-blue; dark thoracic and humeral stripes become indistinct. Lateral views of the head/thorax of the immature (upper panels) and mature (lower panels) female Citrine Forktail and heteromorph Mexican Forktail, AZ.